Figure 1. Hybrid quantum dot-superconducting resonator device. (a) Circuit schematic and micrograph of the hybrid device design. Scanning electron micrograph (b) and cross-sectional schematic view (c) of the nanowire double quantum dot (DQD). The left and right barrier gates (BL and BR), left and right plunger gates (L and R), and middle gate (M) are biased to create a double-well potential within the nanowire. The drain contact of the nanowire, D, is grounded, and the source contact, S, is connected to an antinode of the resonator, oscillating at a voltage VCavity. Qubit-based computing exploiting spooky quantum effects like entanglement and superposition will speed up factoring and searching calculations far above what can be done with mere zero-or-one bits. To domesticate quantum weirdness, however, to make it a fit companion for mass-market electronic technology, many tricky bi-lateral and multi-lateral arrangements---among photons, electrons, circuits, cavities, etc.---need to be negotiated. A new milestone in this forward march: a Princeton-Joint Quantum Institute (JQI) collaboration announces the successful excitation of a spin qubit using a resonant cavity. The circuit, via the cavity, senses the presence of the qubit as if it were a bit of capacitance. 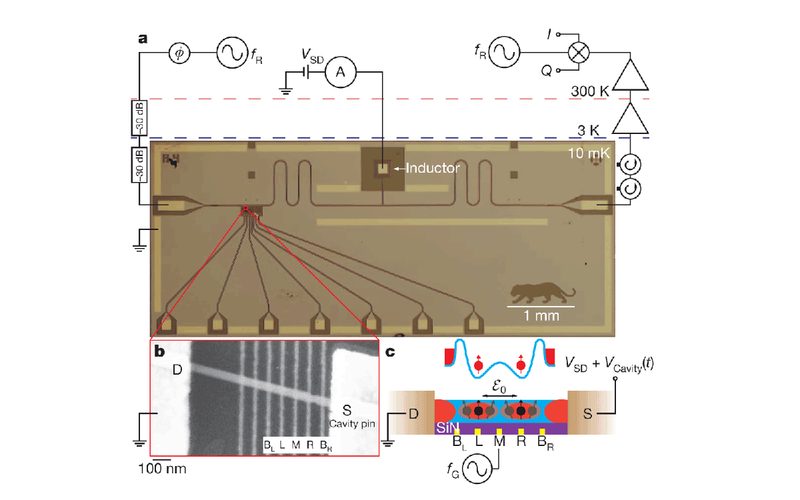 This result, published this week in Nature magazine (*), points toward the eventual movement of quantum information over “bus” conduits much as digital information moves over buses in conventional computers. Another challenge is to control or excite the qubit in the first place. That is, the qubit must be carefully incited into its two-states-at-once condition, the technical name for which is Rabi oscillation. The Princeton-JQI (**) work artfully addresses all these issues. (**) The Joint Quantum Institute is operated jointly by the National Institute of Standards and Technology in Gaithersburg, MD and the University of Maryland in College Park.